Team Transport & Logistics has a fleet of trucks with forklifts mounted on the rear of the trailer. 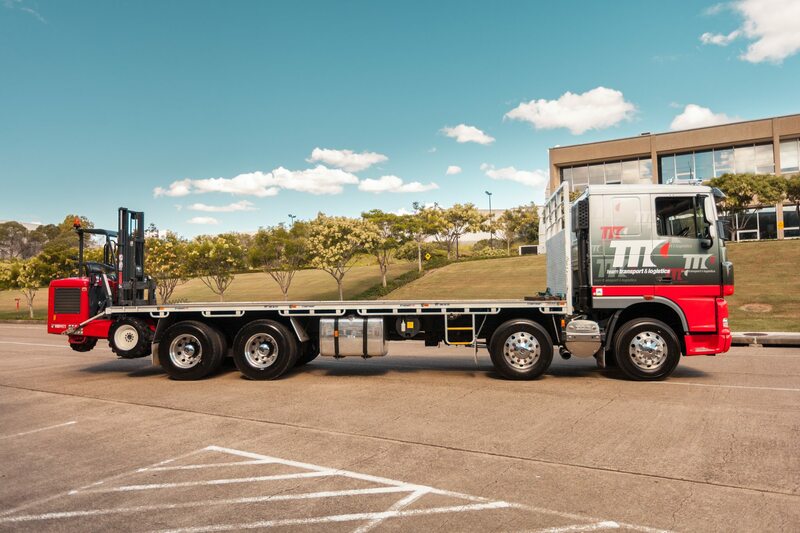 These fork mounted trucks provide our customers with an incredibly efficient end-to-end transport solution. 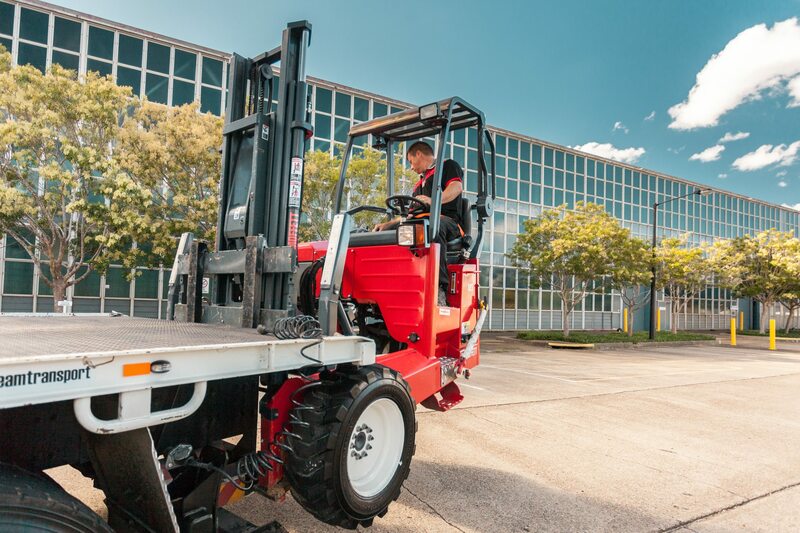 Because the forklift truck includes its own forklift, which our drivers are fully trained and licensed to operate, you now have one vehicle and one operator who can take care of loading, transportation and unloading. Think of the money and time you’ll save by eliminating the need for extra staff and equipment to load and unload your freight! Our fleet of fork mounted trucks can carry up to 22 tonnes of freight, with a forklift capacity of 1.7 tonnes. If you need to move palletised loads such as tiles, scaffolding, bricks and masonry, our forklift truck rentals are the ideal solution. Our trucks are suitable for rough terrain and have fewer restrictions regarding access requirements, so they are suited to almost any application. DAF Prime mover semi trailers fitted with Moffet M5 forklifts. These are capable of carrying 18-20 pallets spaces and 22-tonne load capacity. A brand new DAF CF85 8×4 with an 8-metre tray and 13-tonne load capacity has been added to our fleet. It is equipped with a Moffett M5 capable of loading / unloading 2 tonnes from one side of vehicle – perfect for sites with limited access or 2.5 Tonnes when access to both sides of the truck are available. As a further safety initiative, the Moffetts are remotely operated for loading & unloading, which removes any working-at-heights risks. 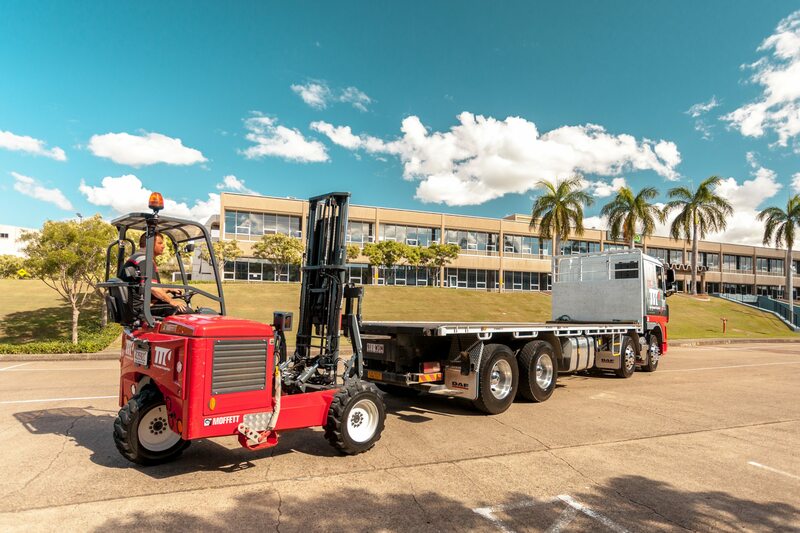 If you need a forklift truck rental in Brisbane, get in touch with Team Transport & Logistics on 1300 645 106. You’ll be amazed at the convenience, cost efficiency and flexibility we can offer your company!